Scores from the: What, we average 96 miles per day for the next 4 days?, bike tour. Indiana: A little weird. After we left Indianapolis we rode by an establishment that had a sign that read: Karl's Karpet Kleaning and I realized we were in the heart of KKK country. The Stars and Bars have also been seen. I considered going up and taking a picture, but I'm riding with another Jew who wears a yarmulka as a do-rag and a 140lb Christian. 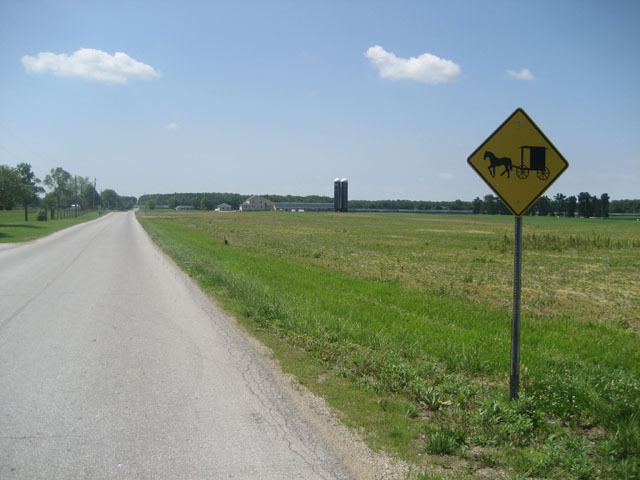 We then rode through Amish country. A little weird. Other wives reading my blog: Peter was talking with his lovely wife Andrea last night and she asked him about his bike problem. What he asks? You know, on Al's blog he mentioned that you were complaining about your touches. He had to explain that I was referring to his, well, touches. 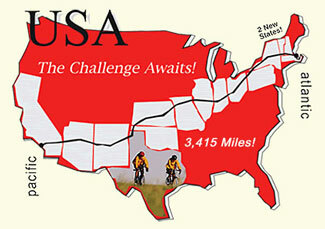 Larry, Rob and Mike: They are leaving AA early tomorrow, driving to Marysville and riding the route backwards to me us. I hope I'm still pedaling when I met them. Weather: predicted 50% chance of rain in Indianapolis today. Nada, not a drop. Nice day to ride, wind was calm to only slightly in our face. I'm convinced the wind is unable to come out of the west. Little known fact: Richmond has more mummies then the rest of Indiana. Little known fact: Richmond was once the lawnmower capital of the world. We left Indianapolis by riding 10 miles on a 6 lane divided highway somewhat similar to Stadium in Ann Arbor. Jim, Peter and I hustled out of town. Chris was riding with our bike mechanic Rick and his buddy Mike and they finally caught us 200 yards before the SAG at the 38 mile mark. We all rode together for another 20 miles, an act of absolute insanity on my part, and finally we got picked by a red light. Tomorrow 103 miles to Marysville Ohio. Riding buddies, Jim and Peter. 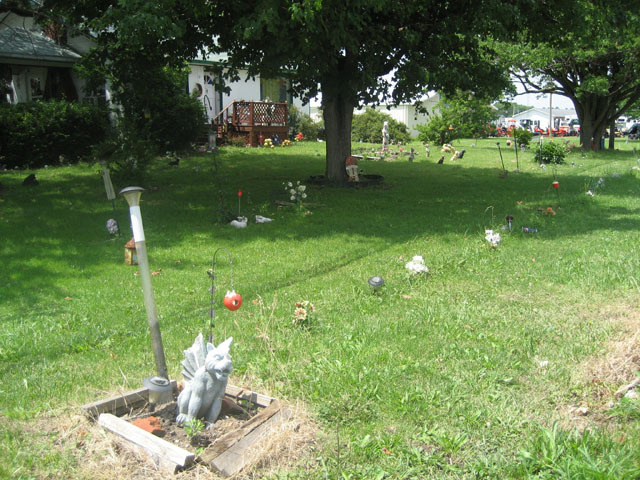 Indiana lawn decoration. Not the oddest we saw. I can't believe that after 36 days you are already at the Ohio boarder. Amazing! Now when you enter Ohio, you might want to stash the Michigan jersey - wearing it in Ohio might be more hazardous that riding in lightning. Another word of caution would be to avoid the temptation to turn left and head North on rt.23 - DON'T DO IT - Zingermanns will still be be in AA when you get home - I know the #4 is tempting but Boston getting closer by the day. Jodi and I will be in Columbus on Sunday for Eric's graduation from OSU. I'm not sure how long that will be but we were thinking of trying to give you a call afterwards - Marysville is not far from there and it would be great to stop and say hello - maybe even find an ice cream shop. Be well, travel safe and avoid rt.23 North. Al, We're looking forward to seeing you tomorrow. I think we'll be first to the hotel... since we're starting there. I grew up in Indiana, but we didn't have lawn decorations. Just lots of dunes and that beautiful Lake Michigan. See ya in the AM.